One of my favourite writers, Sally, champions the district of El Raval in Barcelona. El Raval, also known as Barrio Chino, has long been regarded as an area to be revered with a mixture of fear and caution as is evident from this gloriously damning statement from the 1920s. While opinion is shifting, this negative attitude has persevered; it is as ingrained in some as the morning ritual of taking coffee, a habit that is hard to break. Originally an area of fields and convents, the tidal wave of the Industrial Revolution swept in and in its wake left a hectic spill of greying, restless sprawl that gushed all the way down to the docks. By 1930 the Raval contained 230,000 residents, which calculated as 103.6 people per square metre and ranked as the most populated urban area within Europe. As a result, in stark contrast to the rest of Barcelona city, the Raval is a knotty, twisted den of shadows, quirky architecture and treasure waiting to be discovered. squalid, smirched splendour in the city. There are still some streets that are to be approached with an air of caution but the modern Raval exhibits a deafening multi-cultural hum that blends dirty beauty with art, soul and pumping, thriving, struggling veins of life. Independent businesses continue to move to the area, bringing with them shafts of light, colour and design. Quaint and innovative restaurants pepper the narrow lanes and crowds move in dizzying colours, all shapes and sizes. Times and the cultural landscape they are a-changing and it is about time outdated opinion did, too. 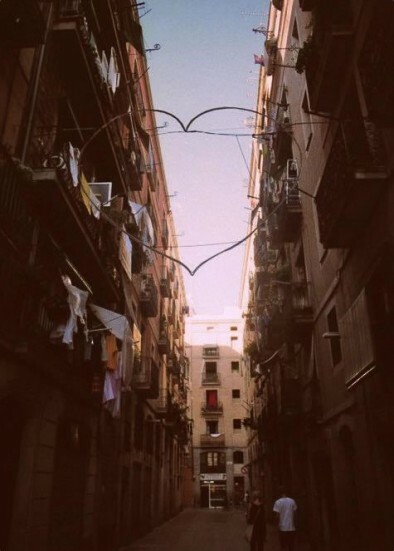 There are plenty of hostels in the Raval but if you really want to feel at home, Home Away offer some excellent Barcelona apartments that feel cosy, safe and boast the best locations. Be sure to brunch! Local lovelies like Caravelle don’t have queues coming out of the door for nothing. The blood orange mule makes the perfect hair of the dog after a hard night dancing and drinking street beers. Shop every day at La Boqueria, the daddy of Barcelona’s food markets where you’ll find delectable delights aplenty and colours bursting from the rafters. Navigate the nooks, exploring design shop treats at the number of pretty independents like Carolina Blue, Fust’am and Grey Street Barcelona where you will also have the pleasure of trying the city’s best coffee at Satan’s Coffee Corner. For astounding views, be sure to venture to the top of Barcelo Raval hotel, with 360° panoramic sights stretching over the rooftops and down to the sea. Sitting at the very centre of the city the fact that the Raval is, in essence, the heart of Barcelona cannot be denied and that for a visitor, it is an excellent choice of location and the perfect base to start your intrepid city explorations. On the very cusp of magnificence, it is THE place to stay. Just make sure to hold onto your hat. The Café Cat and City Kitty (aka as Sally) is a London-based gal with a love of good coffee, independent businesses and making friends across the world. You can tweet her @thecafecat or simply say hi at her Facebook page www.facebook.com/thecafecatblog. You’re a treat. Just arrived in Barcelona for 3 weeks and discovered your blog. You have the same interests and I do. Kitchen Stores and Wine shops. Shall not attempt the wine tour in one day but how I wish. Thanks for being here.